Killing Floor 2 from the official supplier - the company "Buka", to activate the system STEAM. New weapons: MAC-10 SMG, Husk Cannon, AF2011-A1 pistol. New elements of character design, achievements, boxes and much more. Killing Floor 2 will be the successor to the incredibly fun and successful original game, released in 2009. All that you love in this game is back, along with a huge number of new features, characters, monsters and weapons, as well as an epic story. Follow the information! 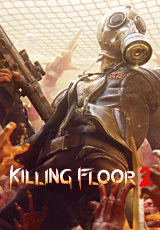 In Killing Floor 2, players are sent into the interior of continental Europe, where the epidemic caused by the failed experiment of the Horzine Biotech laboratory leads to devastating and irreversible consequences that instantly paralyze the European Union. Just one month after the completion of the first part of the game, the monsters captured most of Europe, and human civilization was on the verge of extinction. Communication does not work, governments have dissolved, and military forces are systematically destroyed. Those Europeans who were ready for the end of the world and those who were just lucky are hiding .. But there is still hope. A group of civilians and mercenaries joined together to confront the epidemic and, thanks to the funding of Horzine, created autonomous bases throughout Europe. Tracking the activity of monsters, players will make forays into the infected zones and carry out stripping. Incredible dismemberment. In the game Killing Floor 2 naturalism reaches incredible high. Making their way through the hordes of enemies, players will leave behind their severed limbs and picturesque rivers of blood. But be careful, if you hesitate you will also be torn to pieces. Single player or cooperative for six. The choice of players - a variety of different characters. Go to the meat grinder with friends or try to stop the monsters alone. Creepy zombies. Meet new enemies and favorite monsters from the first part of the game. Guided by advanced artificial intelligence, your opponents will dodge powerful attacks, attack weakened players, pack up and hunt you, making the game more interesting than ever. A new approach to the "complexity". While most games are limited to tuning the health and strength of opponents, in KF2, the level of complexity affects the behavior of Zombies: new attacks, new opportunities, new strategies. Get ready for surprises! A unique mix of weapons. Modern small arms, powerful home-made shells, classic historical guns and finally the Mad Scientist´s arsenal: in the game Killing Floor 2 you will find a unique mixture of deadly guns. Advanced perks system. New and processed perks from the first part of the game, significantly affect the character development and a variety of styles of play. Hot melee battles. Killing Floor 2 completely changes the approach to hand-to-hand combat - deliver crushing blows to opponents.